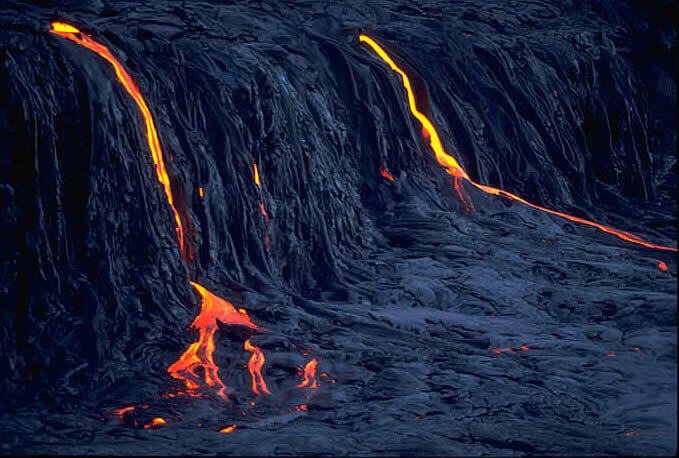 Jealous, moody, easily enraged, the goddess Pele is the primal force that has thrust the Hawaiian islands from the sea. She has fashioned the blasted moonscape on either side of us as we take Chain of Craters Road through Hawaii's Volcanoes National Park. A gentle fog slicks a recent lava flow, creating a shimmering stone pudding that vibrates with her power. Here and there, a few spindly trees force their roots deep into tiny crevices in the lava. Older flows are covered with moss. My cousin Kim Hart and I have come to Hawaii to discover and photograph the forces - natural and human - that have created the "big island." Kim is an American photographer based in Norway. I am a television producer and writer. Although I live in Boston, I am part Hawaiian - my father and grandfather were born in the islands. This trip is a return to my roots. Descending toward the coast, Chain of Craters road bends in a tight switchback. The ocean swings wide before us, a shimmering blanket to the vanishing point. In spontaneous awe, we exclaim aloud. We stop. The road snakes down the Holei Pali fault scarp and disappears suddenly behind two pillars of smoke rising majestically where active lava flows meet the ocean. "Don't wander into the active flows!" he tells us. "There are lava tubes that will give way beneath your weight. Your next stop will be a bath in molten lava. And be careful near the edge of the lava beds. The cliff fractured and a tourist plunged a hundred feet into the ocean. We never found him." We have arrived at the Golden Hour, the time just before sunset when the coast is painted in a gentle yellow sheen. Ribbons of lava are revealed in the gathering darkness. A scarlet stream flows down a volcanic delta and cascades into the surging ocean. Clouds of steam obscure its glow. We are surrounded by hundreds of tourists but they are stunned to silence by the awesome natural spectacle. I hear a muffled popping like a package of Chinese firecrackers exploding in the distance - the sound of molten lava as it is extinguished by the ocean's embrace. Kanaloa, god of the sea, and Pele, goddess of fire, are mating in an ancient ritual of island building and wearing away. Geologists know that Pele is the primal engine of our planet. Dozens of miles beneath where we sit watching her fireworks, is a "hot spot" - a point of intense thermal energy. As the abyssal ocean floor rides the Pacific plate to the northwest, a few inches a decade, it passes over the hot spot. 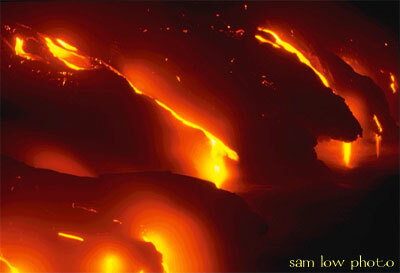 Molten magma flows upwards to form the Hawaiian island chain. Kauai formed five million years ago. The plate carried it northwest. Oahu slid over the hot spot and coalesced, then Molokai, Lanai, Maui, and Kahoolawe. Hawaii is still forming right in front of us. Because Kauai is older, it's landscape is deeply eroded by tropical rains. Hawaii, the youngest, retains its voluptuous curves. The next day, we ride the curve of Mauna Loa on Highway 11, descending the ancient volcano's gentle arc toward the district of Puna. We follow route 130 until it dead ends where glistening mounds of lava have pushed into the sea to form a new coastline. Beneath are dozens of cement foundations, all that remains of tract houses built in harm's way only a few decades ago. Puna is home to a human tide that washed over the islands in the late sixties. Pahoa, once a sugar plantation town, now bustles with New Agers. Former Japanese storefronts are emblazoned with signs that advertise natural foods, Zen therapists and paraphernalia for the enjoyment of marijuana. A few aging hippies with long flowing beards stare at us as we drive past. Kim and I move on, seeking the remnants of an older Hawaii. We follow a narrow road, bordered by thick stone walls. I imagine they were built by the retainers of ancient Hawaiian Kings or the hired labor of long gone plantation barons. On each side, the land rises to the height of a tall man, like the roads in Wales that run below high hedge rows. Perhaps, as in Wales, this road has been dug into the earth by centuries of traffic. Suddenly, we enter a natural cathedral of trees towering a hundred feet to a canopy of delicate green lace. Looking up, we see a river of light where the leaves have touched each other and have been worn away as they sway in the constant Trade Winds. We are dwarfed by an explosion of leaves - spear shaped, rounded, lacy. I imagine the dense growth conceals the ruins of a magnificent planter's house, its gardens lost in creepers, its verandah fallen in upon itself. There is the aroma of moist growing things, a lingering smell like that of rotting coffee grounds. That night, we drive up the northern flank of Mauna Loa toward the town of Waimea. The sun sets ahead. A low pressure area has passed over the island, bringing steady northern winds, cleaning the air. Against the sun's glow, windbreaks of Ohia trees fan bare limbs against the sky. 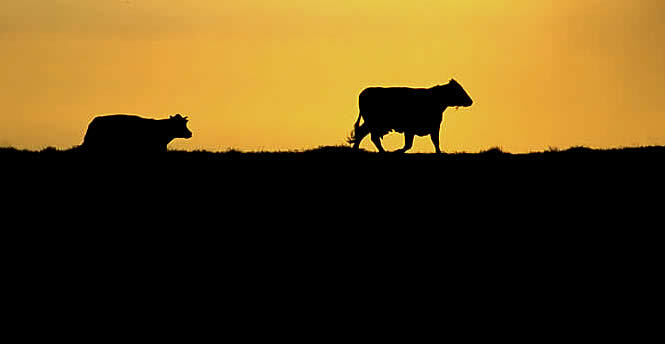 Cattle stand on small rounded hills in crisp silhouettes. Darkness sets in quickly. Waimea sits in the saddle between Mauna Kea to the south and the Kohala Mountains to the north. This is the home of the world famous Parker Ranch, the largest family-held cattle outfit in the world. The ranch was founded by my great-great grandfather, John Palmer Parker, a native of Newton, Massachusetts. In 1815, he was among the first white men to settle in Hawaii. Twenty-three years before Parker's arrival, King Kamehameha the first received a gift of a bull and five cows from the British explorer Vancouver. The king ordered that no-one touch them, under penalty of death, so they would multiply. When Parker arrived, the mountains around Waimea teemed with wild cattle, poising a threat to man and nature alike. Parker received the sole privilege of hunting these cattle for hides and meat. After marrying a royal chiefess, Kipikane, Parker built his home on the slopes of Mauna Kea at the end of a horse trail, a few miles from Waimea. "It was an enchanting place, luxuriant with Hawaiian forest growth," wrote my great Aunt, Mary Low, who grew up on the Parker homestead. "They loved the Mamane, the Maile, the Hapu'u tree ferns, the many birds of yellow, green, and red and the black ones with yellow tuft-feathers, singing and flying about. Kipikane wanted to live there immediately... 'At once! At once' as she said happily. In a couple of days there were two new hale pili (grass houses) being erected by her numerous retainers." The hale pili were soon replaced by a proper New England salt box home which Parker finished off with a gleaming interior sheath of Hawaiian Koa, a wood like Mahogany. The original house still stands where it was built, but a more accessible replica is at Pu'u'opelo, in Waimea, which is open to visitors. Kim and I visited Pu'u'opelo and the nearby Parker Ranch Museum in Waimea Town to piece together the history of this famous family. Parker became a renowned hunter of wild cattle. Roaming the Kohala mountains and ascending the slopes of Mauna Kea with his percussion cap musket, he built his first fortune by selling the meat to visiting whale ships and the hides to markets as far away as Boston. Later, he purchased land for a ranch and imported Mexican vaqueros to teach Hawaiians to ride and rope. Today, Hawaiian cowboys are called Paniolos which is a "Hawaiianization" of the Spanish word for Spain - Espanol. After Parker's death in 1868, his children continued to grow the ranch. 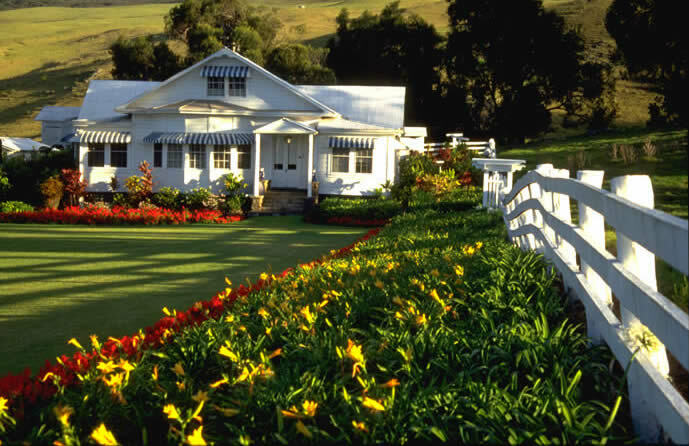 Today it sprawls over 227,000 acres of the finest grazing land in Hawaii. Surrounding Parker Ranch are many smaller ones with poetic Hawaiian names - Huehue (overflowing again and again), Kahua (the foundation), and the ranch my grandfather started in 1884, Puuwaawaa (peak with gulches). On Thursday, we take the high road over the Kohala Mountains through ranch lands shrouded in mist called Vaug. It's caused when the clouds of volcanic steam from Mauna Loa float into these mountains - the same clouds we had seen a few days earlier rising over Chain of Craters Road. Suddenly the sun breaks through. The pastures glow with a green so brilliant that it seems the light must be coming from deep beneath the earth. "I have seen as many as two hundred men take part in the big Parker Ranch drives. There are many others who sit atop the corral walls to watch when the branding begins. 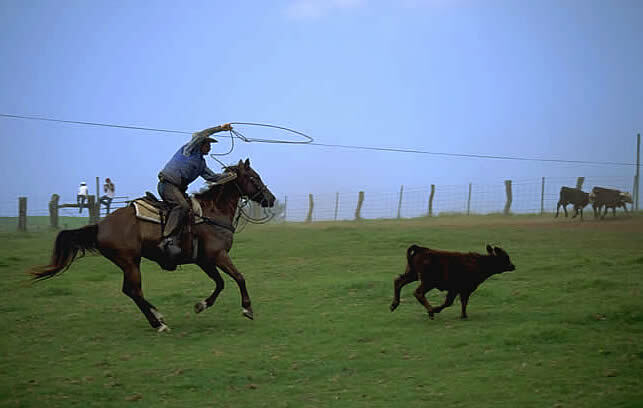 Only expert riders and ropers can control the calves efficiently and tenderfeet would only be in the way or add danger to the cowboys and themselves. Not only are the cowboys and horses carefully selected, but also the crew handling the throwing of calves, tending the fires and the branding irons. The branding men must be strong and fast and know their business of burning just right. Several others must be expert in castrating and ear marking for these jobs require skill and precision." During a rest break we meet the owners of the ranch, Angie and Pono Von Holt. Angie tells us that their ranch, Pono Holo, is small by Hawaiian standards, 10,000 acres with about 7,000 head of cattle. Even so, its a big business. The Von Holts fatten the calves here during the wet Winter months when the grass is tall and verdant. In the summer, they are shipped to another Von Holt ranch in Oregon for final fattening, then to the slaughter houses in Chicago. Driving home that night we stop just above Waimea to watch the sun set. In the distance, Parker Ranch grazing lands sweep gracefully up toward the summit of Mauna Kea over smoothed low hills punctuated by cinder cones. As the sun sinks lower, giant cumulus clouds heave their bellies over the summit. Emerald green paddocks stretch from about half way up Mauna Kea right down to the shimmering ocean 15 miles away. The only sound is the gentle bellowing of cattle. "As I sit here and write these few lines, it brings back memories of that magnificent growth of stately trees and dense growth of ferns, so thick that it was a physical impossibility for man or beast to penetrate. The whole forest was a living swamp, ponds of water everywhere, wild ducks by the thousands. This dense forest extended from the 5,000 feet elevation to 3 miles from the coast and hardly a stream that has an outlet to the ocean was ever known to be dry. And just consider that this forest has disappeared within my memory and not a log or a tree trunk of 4 or 5 feet in diameter can be seen, all disappeared into eternity, ashes, and the memory of the old timers, and I am one of the last. Since the introduction of cattle, goats, sheep and hogs with no provision of safeguarding the forest by fencing, that forest has disappeared in the astounding short time of 60 years." The next morning, Kim and I watch the sun rise from the verandah of our rented house. 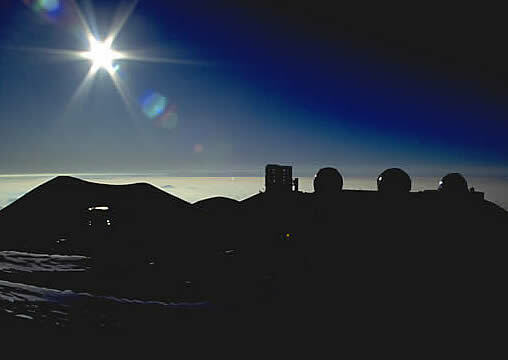 Mauna Kea sweeps in a graceful arc from the sea to an altitude of 13,600 feet. We decide to find out what the view is like from its peak. The summit road curves through unfenced Parker Ranch range land where we are on the lookout for wandering cattle. At about 8500 feet above sea level, the road works through low hanging clouds. The ascent is steep. The air thins. We feel light headed. At 11,000 feet, we break through the clouds into clear blue sky. Ahead, the road to the summit of Mauna Kea ascends so steeply I wonder if our car will make it. At the road's end, about 13,000 feet above sea level, crisp geometric shapes rise into the azure sky - observatories that search deep space through the clear air at this high altitude. In the thin air and gathering cold, I find that I must move slowly or I will be winded. The winds here can reach a 100 miles an hour, but today they are light and pleasant. By six P.M., the sun sinks quickly toward the cloud layer, painting the observatories a gentle pink. The cold seeps in under our parkas. To the north-west, Maui floats in a sea of cotton. As the sun drops, the horizon becomes blood red and the sky deep purple. Giant slits in the observatories open - the domes swivel to their assigned area of deep space. For the astronomers it is time to go to work. For us, it's time to go home. I have been warned not to ride the brakes during the steep descent, so I pump them when we reach twenty miles an hour. Darkness envelopes us and for a time we seem to be flying through a sea of diamonds. Never before have we seen the Milky Way so clearly. In low gear, it takes 45 minutes to make the 8 mile descent. Not knowing the danger, we made the trip to the summit in a rented economy car. Later, I read the following in a Guidebook: "Don't even think about driving an ordinary passenger car all the way up Mauna Kea, even in the best of weather. ...You can't gear an ordinary passenger car down far enough to descend the steep road without riding the brakes. You'd almost certainly burn out the brakes, lose control of the car, and join the ghosts of others who've lost it on that road. It is possible to drive up and back if you rent a suitable 4WD vehicle." On Saturday we take the shore road along the Kawaihae Coast toward Mahukona Harbor. The land on both sides seems arid, useless for human habitation. But from the road we see stone platforms which mark the place of ancient temples or heiau. I remember once flying over this landscape in a helicopter. In the slanting early morning light I saw thin spidery lines, arrow straight, stipple the land below - all that remains of stone walls built by ancient Hawaiian farmers. Perhaps the early Hawaiians knew how to cultivate crops in a dry environment, but more likely, before the ravages of cattle and sugar plantations, this place was once much wetter. We turn down a one lane road toward Mahukona - once a port where cane sugar was shipped to the mainland from thriving plantations. Today, all that remains are foundations and rusted bits of metal. "The labor in South America was cheaper and the land more valuable for development than for farming," says Sonny Solomon, our guide for the afternoon. We have come to Mahukona to visit a much earlier site, the Ko'a Holo Moana heiau, a temple dedicated to the arts of Polynesian navigation. The first Polynesian seafarers set out from Tonga to explore the vast Pacific Ocean about 1300 BC, as the walls of Troy were falling to the Greeks. By the time of Christ, they had discovered and settled most of the great Polynesian triangle with the exception of the most remote islands of all - Hawaii. Some archaeologists think that the first Polynesian canoes arrived at South Point, the southernmost tip of the Big Island, about 1000 AD The Navigators who guided those canoes were revered in ancient Hawaiian society. Sonny and I scramble up a steep hill to the heiau which sits on a promontory above a small bay. "The ancient Hawaiians had a canoe anchored right there," Sonny tells us, pointing to the bay, "and the student navigators slept on the canoe to feel the movement of the waves which they would use as a natural compass when they became full fledged navigators." Today we know a great deal about this wayfinding art because of the voyages of Hokule'a, a replica of an ancient Hawaiian canoe, which first retraced the route between Hawaii and Tahiti in 1976. Sailing across 2200 miles of open ocean, the canoe was guided by one of the last navigators to know the signs written in waves and stars, Mau Piailug from the tiny Micronesian atoll of Satawal. In 1981, I journeyed to Satawal to produce a PBS documentary about Mau's seafaring skills. I sailed with him aboard his swift proa which he fashioned without plans from the log of a breadfruit tree. At night, in his darkened canoe house, he unfolded a woven pandanus mat before me and placed 32 lumps of coral upon it to represent the rising and setting points of the stars that define his "star compass." He taught me the direction of ocean swells that he steered by when clouds obscured the sky. Mau allowed me to enter a world in which writing, maps, sextants and compasses were replaced by a knowledge of nature so profound that he could sail with confidence anywhere in the world. Since then, Mau has taught young Hawaiians to navigate in the traditional way and his students have sailed 45,000 miles aboard Hokule'a throughout the Pacific to kindle a new pride among all Polynesians. Ascending the hill at Mahukona, Sonny stops before a tall standing stone. "That is Kanaloa," he says, "it's got to be because it's the nearest to the sea." Up-slope from Kanaloa is a platform of black volcanic rock dominated by dozens of stone pillars radiating away in myriad directions. There are many strong alignments - three pillars seem to march in the general direction of Tahiti, others could be solstice markers. Sitting on the heiau, I imagine a double hulled canoe at anchor in the bay. In the distance, another canoe sets out with a class of navigator apprentices for a session at sea. For these ancient mariners, the ocean was a road that joins Hawaii to Tahiti and on to the Cook islands, to New Zealand, and to the thousand other islands that make up the greater society of Polynesia. On Sunday, our last day, we descend from Waimea along a road that drops 2500 feet to the tiny town of Puako on the South Kohala coast. Here, thirty years ago, I remember driving a jeep down a one lane track to my family's beach house at Paniao ( "place of swirling waters" ). In 1964, Paniao was ten acres of lava, crab grass, and a shack blackened by decades of salt spray where we lifted shutters to let the Trade Winds blow through and lit kerosene lanterns at night. Today, the shack is gone. In its place, a rock star and a local entrepreneur have built two majestic homes. Development catapulted taxes so high that my family was forced to sell the land. Along miles of coast, where fishing shacks once stood, Kim and I find palatial homes. A small ocean front house lot costs a million dollars, or more. Resorts spread golf courses over once barren lava beds. We drive on to keep a scuba diving appointment at one of them. Anchored off an eroded lava flow, we slip beneath the ocean's surface to a world that has escaped the forces of development, the domain of Kanaloa. If Pele is fierce and hot, Kanaloa is gentle and cool. We hang suspended over a reef, moving with the regular swell. 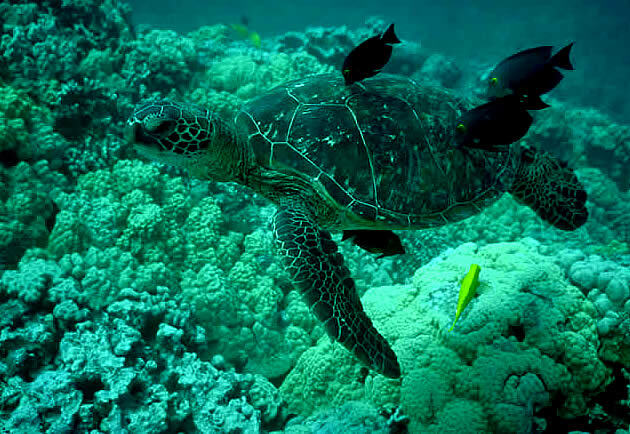 Beneath us, a sea turtle is tended by rainbow hued fish with lyric Hawaiian names, Lau'i-pala, Kihikihi and Paku'iku'i. All around us, Kanaloa has reshaped the work of Pele to his own artistic tastes, smoothing sharp edges of lava flows and adorning them with coral. We swim through lava tubes, natural arches which formed as the molten rock cooled. Later, as we bask in the bright sunlight, I admire Kanaloa's shimmering surface. 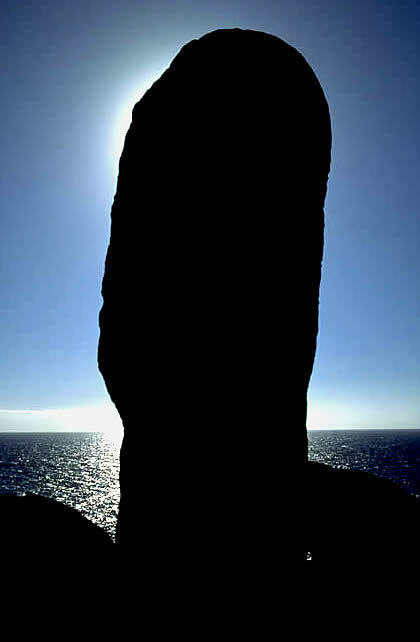 It is the ancient road that beckoned Polynesians to feats of exploration that no other people have quite equaled. Compared to them, the Greeks, our heroes of the dark ships, were timid coast-huggers. Fearful of sailing at night, they beached their ships when the sun set. The Polynesians welcomed darkness for the stars provided a compass by which they steered their powerful canoes. Fifteen hundred years before Europeans learned to fashion sea-going vessels staunch enough to discover Hawaii, the Polynesians had explored and settled the entire Pacific, one third of the earth's surface. Kanaloa provided the highway - a deep human urge to explore carried the ancient Hawaiians across it. Tomorrow, Kim will fly back to Norway and I will return to writing a book about my Hawaiian grandfather, Rawhide Ben, and his cowboy world. In only five days, we have managed to sample the Hawaiian genesis - the forces that shaped this island state - the deep pyrotechnics of the earth's core that are expressed all around us; the first Hawaiian settlers who built their settlements to blend with nature so well that traces of them have virtually disappeared; my New England ancestors who realized profit from cattle and sugar, forever changing the face of the island. And at the very pinnacle of Mauna Kea we found men and women who imagine voyages to distant stars and plot the maps that may someday guide astronauts to new settlements. As I thought of these modern explorers, I realized that they will pilot their course by the same stars that once guided Polynesian mariners as they crossed the vast and heaving road of Kanaloa - to Hawaii.